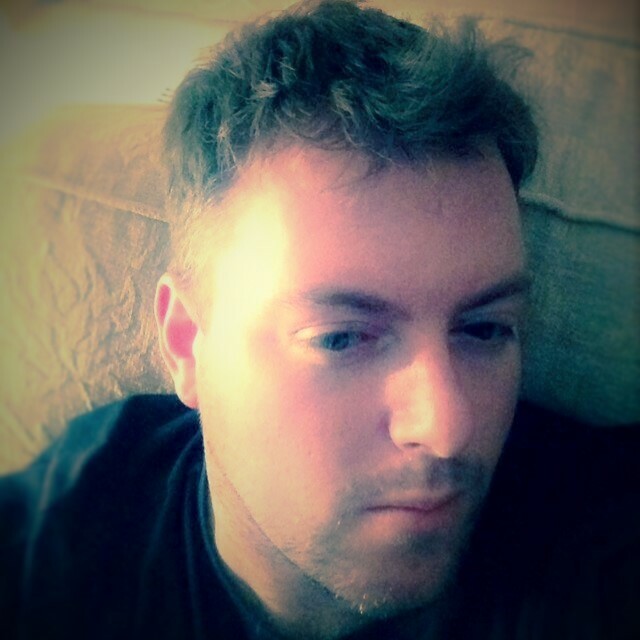 Today we welcome historical novelist David Cook to our blog. 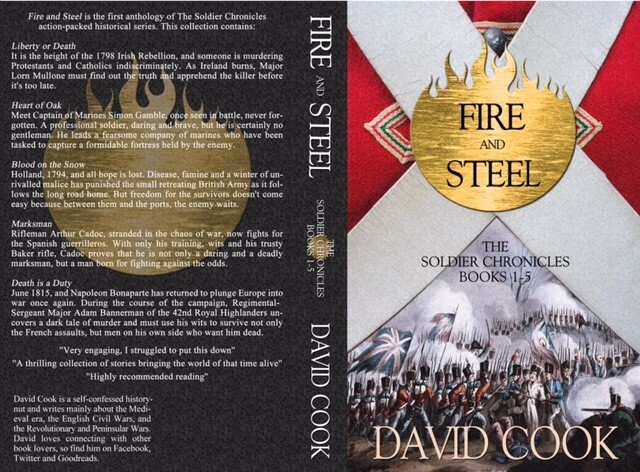 David has just released the anthology Fire and Steel, which brings together books 1-5 of The Soldier Chronicles for the first time. I love to lose myself in a historical read and I therefore jumped at the opportunity to pose some searching questions on the anthology and find out more about David’s novels and his writing career. The e-book is now available to purchase on Amazon and we are delighted that David has permitted us to share the gorgeous cover of the the forthcomomg print version, which you can find below. The book will be available in print from December 1st. 1. 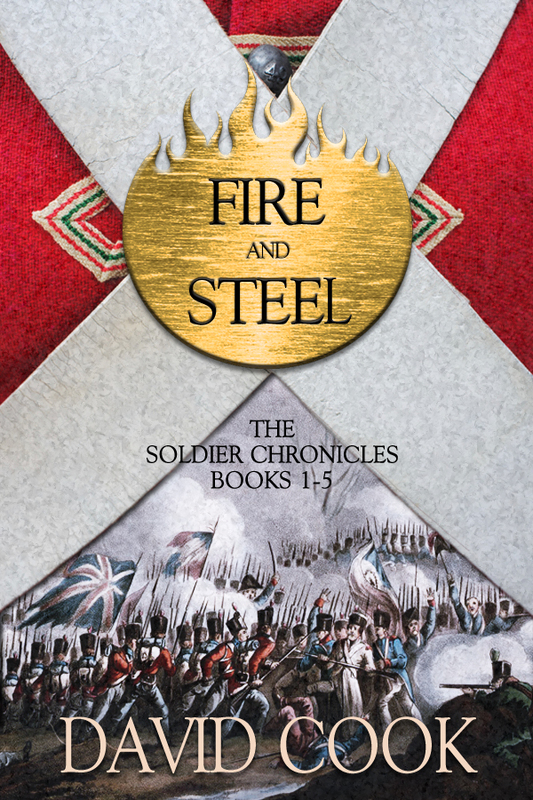 Welcome David and thank you for taking time out of your busy schedule to tell us more about Fire and Steel and your love of the past and writing.You clearly have a passion for this tumultuous period of history. What inspired your love of this period and what is it about it and its military history in particular that appeals to you? It all came from my father. He hand-painted his own model army and gave it to me. It’s wonderful and a testament to one man’s devotion to painting, military research and war gaming. My love of history all comes from him too. 2. I expect that you spent many hours devoted to research to enable you to write the books in the series. How do you carry out your research? Is it mainly internet and or archive based or do you also visit the places and battlefields portrayed in the stories? I’d love to visit all the places I write about, some I have, some not so. I think it’s important to. I will attempt that when I have time and money. However, I search online for images of the place, use my reference books and visit museums and libraries to fill in the missing gaps. 3. I have to ask this as I love to watch historical re-enactors! Are you a member of a re-enactment society or have you considered joining one? Have re-enactors helped or inspired your writing? I’m not a member, but it’s always exciting to meet people who are. You feel their love of what they do and do learn from them. They are the best educators. I learned a lot of what happens on the battlefield from re-enactors, not films. The gun smoke, the noise, the commands, the visuals. It has been very inspiring to watch the bicentenary battles of Waterloo back in June. I have hours of cavalry and infantry manoeuvring and battling on video from then, it was a fantastic experience. 4. Your books are full of individuals who perform heroic deeds. Are any of the fictional characters in them based on real life historical figures you have come across in your research? 5. Have you got a favourite character out of the five books that comprise Fire and Steel? No, I haven’t a particular favourite. To me, they are all my beloved. 6. What is your writing process like? Do you plan your books and develop character profiles in detail before beginning a new book in earnest or do your stories and characters take on a life of their own? Research is never-ending. I enjoy it, but writing is the best part. I sketch out a rough idea what the story will be and let the characters take over. Sounds chaotic? Well, I’ve known authors who plot everything down the smallest detail. I’ve never been able to. I just let the writing flow. It seems to work. 7. How long have you been writing and would you like to tell us about other books you have written or are working on? I first started to write when I was 16, then through my twenties, but it was in 2006 that i sat down and started to write my first novel. It’s called The Desert Lion and is about the British liberation of Egypt, 1801. From there I wrote The Wolfshead, a story of Robin Hood. I have written two novella’s following the events of The Wolfshead, a Richard III story, but they are all unpublished. I am working my way through them as I type, hoping to try the traditional publishing route for The Desert Lion. 8. How do you fit writing in around everything else and do you write every day? At the moment it’s a hobby. I’ve released 5 novella’s, a free collection of short-stories and now Fire and Steel as a novel, but my goal is to reach readers and get word of mouth. It’s not about money for me, it’s purely pleasure. My dream is to be published. One day…. 9. What do you like most about being an author and what do you find the most challenging? The fact that I can just sit and write about my characters and history. The challenging part is the research and the marketing of the work, the exciting bit is the writing. I find it thoroughly relaxing. I love connecting to readers. 10. Social media – love it or loathe it, it appears to be here to stay. Do you view it as your friend or foe or a double-edged sword for today’s authors? For me it’s a necessary tool. I don’t think I use it to its full potential though. It’s useful and I couldn’t live without it, but I don’t spend hours on it. 11. Have you a message for readers? I hope you enjoy my work. As a fledging indie author I really do appreciate it when readers leave me a comment about my work or a review. Reviews on Amazon and Goodreads really do help. Thank you for investing your time reading something of mine. Thank you David for taking time out to tell us about Fire and Steel and share your experiences with us. We wish you the very best with your writing career. It is the height of the 1798 Irish Rebellion and someone is murdering Protestants and Catholics indiscriminately. As Ireland burns, Major Lorn Mullone must find out the truth and apprehend the killer before it’s too late. Meet Captain of Marines Simon Gamble, once seen in battle, never forgotten. A professional soldier, daring and brave, but he is certainly no gentleman. He leads a fearsome company marines who have been tasked to capture a formidable fortress held in enemy hands. Holland, 1794, and all hope is lost. Disease, famine and a winter of unrivalled malice has punished the small retreating British Army as it follows the long road home. But freedom for the survivors doesn’t come easy, because between them and the ports, the enemy waits. Rifleman Arthur Cadoc, stranded in the chaos of war, now fights for the Spanish guerrilleros. With only his training, wits and his trusty Baker rifle, Cadoc proves that he is not only a daring and a deadly marksman, but a man born for fighting against the odds. June 1815, and Napoleon Bonaparte has returned to plunge Europe into war once again. During the course of the campaign, Regimental-Sergeant Major Adam Bannerman of the 42nd Royal Highlanders uncovers a dark tale of murder, and must use his wits to survive not only the French assaults, but men on his own side who want him dead. I am an avid reader of historical romances encompassing all time periods. Regency romances feature high on my reading list as there are a huge number of authors who choose to set their novels at this time, following in the footsteps of the great Jane Austin and more recently Georgette Heyer, whose novels I devoured as a teenager. Mary Balogh is one author I go to when I want to be guaranteed a great romantic read, which conjures up the Regency period perfectly and has engaging characters that often differ from the usual lord or lady. Her Huxtable Quintet, and her Bedwyn, Simply and Mistress series being amongst my favourites. 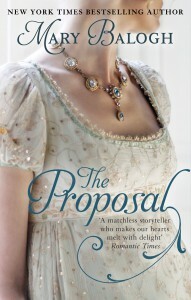 The Proposal, the first book in her new series, The Survivors’ Club, deals with the romantic entanglements of seven individuals who have been injured in or by the horrors of the Napoleonic wars. Five of them are officers who have been wounded, one is a woman, who witnessed her husband, a Surveillance Officer, tortured and finally shot by the enemy and the other the Duke of Stanbrook. The Duke, who lost his son in the war and his grieving wife to suicide soon afterwards, opened up his home Penderris Hall to aid their convalescence and recovery and return to civilian life. They formed a strong bond during their time at Penderris and meet at there for a few weeks each year to enjoy each others’ company and offer mutual support, each of them having sustained physical and mental wounds of varying natures. I love reading about heroes and heroines who have had a difficult past, where they come together to find happiness and I have been looking forward to this series for a while. In The Proposal the hero is Hugo Emes, Lord Trentham, a title he was awarded due to his bravery in the Peninsular. Hugo does not bear any physical scars from the war. Instead he harbours the mental scars of survivor’s guilt at having led so many men to their deaths for the greater good. After his initial convalescence at Penderris, Hugo has found solace in retiring to the country and working the land for a year or so. However, he now decides that he must honour his deceased father’s wishes and marry and produce an heir to inherit the family business. What he wants is a solid middle class woman who is best placed to understand and support him. Shortly after arriving at Penderris, Hugo decides to take a walk on the adjacent beach, joking with his friends that he will perhaps find a bride there. He comes across a woman with a badly sprained ankle. Lady Gwendoline Muir has survived a number of tragedies in her life. Her husband died in a sudden accident and she has a limp, the result of a fall from a horse. Gwen and Hugo, from different worlds, clash immediately – she is a respected member of the aristocracy and the ton and he is an outspoken middle class ex-army officer who does not mince his words. However, as Gwen is compelled to remain at Penderris to recuperate, a strong physical attraction develops between them, which they cannot resist. They also begin to find out the truth about each other and form a deep attachment. However, is it love or lust? What will happen when Gwen returns to her aristocratic roots? Will she be happy to reprise her role as sister and aunt after tasting such passion? Also will Hugo be able to take up the reins of his family business and find a suitable middle class wife as he wishes? Is there a future for a couple with lives so disparate and with prejudices on either side? What follows is a touching romantic tale examining if two people from two different classes can find some middle ground on which to live the rest of their lives together. There is also the added question of whether Gwen feels that she can afford to love a man as mentally scarred as Hugo after experiences she had in her first marriage. I found that the novel was beautifully written and sensitively examined the unseen wounds which individuals can bear after traumatic experiences in their lives. I loved the characters of both Hugh and Gwen. Hugh is a taciturn and outspoken member of the middle class, uncomfortable around the aristocracy, many of whom resented his rise up through the ranks in his army days. When it comes to broaching the physical attraction that exists between him and Gwen he is outspoken, often shocking Gwen with his words. I also sympathised with him as he had clearly suffered from Post Traumatic Stress, as well as survivor’s guilt. Gwen never thought that she could find love again and is taken completely by surprise at the attraction she feels for Hugo. I love how despite their initial misgivings about a permanent relationship they came together. I recommend this novel to readers of romance who are seeking a truly romantic and heart warming read. I am very much looking forward to the next in the series, The Arrangement, which tells the tale of another member of The Survivors’ Club, Viscount Darleigh, who we met in this book.